Mobile shelving. also referred to as “roller racking” is a shelving system mounted on a movable platform or cart which sits on rails either embedded within your floor or sitting on top of your floor. 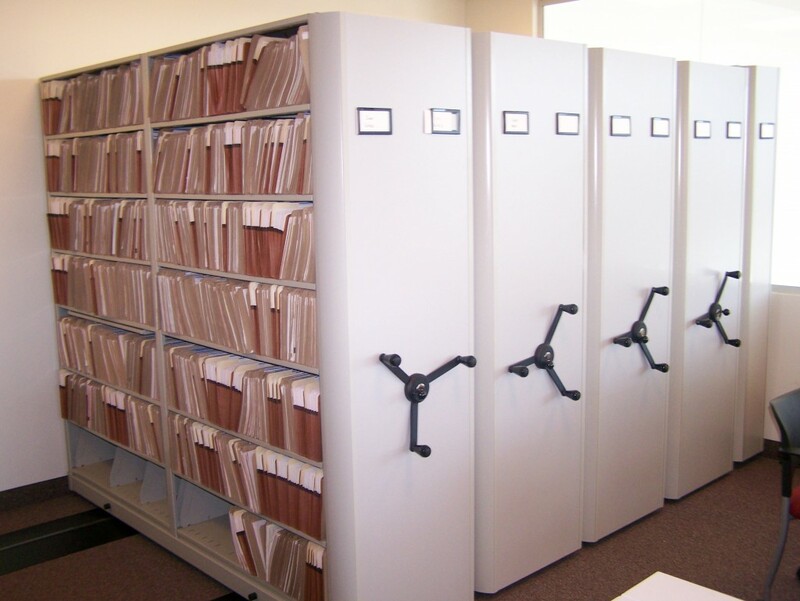 These systems are ideal for filing, archiving and retail stockroom storage, especially where there isn’t a lot floor space available. Although mobile shelving technology has been around for some time, it hasn’t been until recently that consideration has been given to applying such systems to all realms of shelving. Whether an office setting, retail application, or a storage room, the principles remain the same – wherever there is stock with limited activity, a mobile platform immediately recoups 50 percent or more of your space for more productive activity. What was once one aisle for every back to back shelf will now become one aisle to be shared amongst 7 or 8 back to back shelves. 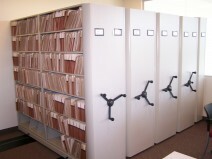 We have one of the most complete arrays of mobile shelving systems from office to stock room to warehouse. Questions? We offer free consultation and are here to help! Contact us, or request a quote.